Aluminium is the perfect material for architectural glazing products, and has practical advantages over all other available choices, including inherent resistance to corrosion and very low whole-life costs. Aluminium is also an environmentally friendly material and possibly one of the best options for energy saving within the construction industry. AAFCO is an innovative, dependable and trustworthy partner in architectural design, consultancy and engineering services. Our comprehensive services have benefited corporates, real estate property developers and individuals looking for value engineered solutions. Quality, Commitment to provide innovative solutions on time, this is what our customers associate with us. Perfection and Quality are our hallmark. We believe that our task is not merely to sell high-end products, but to understand the science of things and offer the right solution. 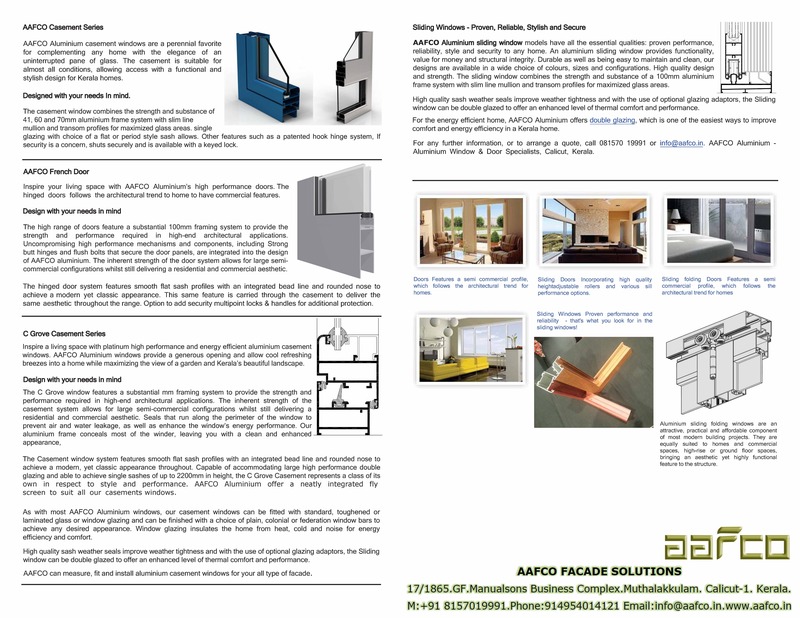 Think of the most advanced architectural products and solutions and you will think of AAFCO. As the representatives, some of the India’s leading specialist manufacturers, we are a one-stop shop for every architectural requirement for a building's exteriors to its innards. That is not all. We also design and execute projects, collaborating with architects from an early stage to ensure the highest quality standards and most optimum solutions in architecture in our products. The aluminium lifecycle is infinite. Shown as a graph, the trend wouldn't be simply circular, but cyclical: from bauxite to billet and from extruded profiles to windows and then, after a long period of use it is scrapped and turned again into billet. And so the cycle continues.